soup | What's for tea tonight dear? My favourite mushroom soup began life as a stuffed cabbage which, as opening gambits go, is going to require more explanation than most. I’d intended to make Valentine Warner’s spectacular savoy cabbage stuffed with mushrooms, leeks, walnuts and stilton. It’s a vegetarian friendly dish so splendid that you might want to invite your non carnivorous friends over just for an excuse to make the blighter, assuming of course that you eat meat in the first place. As one of my guests on the night in question eschews red meat I was glad of the opportunity. Seriously, even if you don’t try these soups you must try Val’s cabbage. But it was one of those days. Time had completely run away with me in the kitchen and, even though I’d prepared the mushroom and leek component of the stuffing [PS – you’ll need to do the same], when it came to preparing the cabbage the leaves all split on me. And you can’t make stuffed cabbage with a pile of shredded, tatty leaves. What was a boy to do? The close [though geographically distant] relatives were starving to death in the other room after a long drive, and were being ‘entertained’ by the Shopkeeper. Food was needed, and fast. As luck would have it there was double cream in the fridge and some decent vegetable bouillon powder in the cupboard. A good splash of dry sherry went into the mushroom pan and once almost evaporated was joined by half a litre of vegetable stock, 300ml of cream, and a bunch of thyme tied with string. After a few minutes of simmering, a very good dose of seasoning [as I think I’ve said before, cream dishes need plenty of seasoning], and a blitz with a stick blender – hey presto, soup! NB – if you also need to do this quickly then don’t repeat my mistake and remember to remove the bunch of thyme tied with string before blending. Stick blenders, it turns out, don’t get on well with string [who knew? ], and the time spent disentangling it and then passing the soup through a sieve causes further and entirely avoidable delay! Whilst the above is not really time consuming [especially if you’re not in a flap at the time] what follows is even quicker and easier. I made it one day when working in the shop and with half an hour off to come up with some lunchtime sustenance for three hungry cheesemongers. This will make three decent sized mug-fulls. 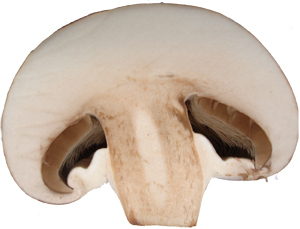 Fry the mushrooms in the oil over a relatively high heat and season with salt and black pepper. Once well coloured add the garlic and rosemary and cook for a couple of minutes more. Add the chicken stock and cream, bring back to the simmer and cook for five minutes. There is less cream here but you will still need to check and adjust the seasoning. Ladle into mugs and top with a splash of chilli sherry*, another marvel from Mr Warner. *Sorry but I can’t find a recipe for Valentine’s chilli sherry online, and I wouldn’t reproduce it without permission, so if you don’t already have it you’ll need to buy his book. When you live in or around London there seems to be no bigger a challenge than getting from one side of it to the other. You pick your compass point [I’ve done them all over the years] and can normally manage to make it from there to the centre and back, but god forbid you should be forced to make the tortuous schlep across town. We’ve got friends in Switzerland we see more often than those round the South Circular. So I was surprised and delighted when the lovely Lucie and Lucas trekked all the way from Camberwell for my recent birthday drinks in St Margarets! I daren’t even check the details on the Transport for London Journey Planner for fear that the sheer number of connections and modes of transport will crash the site permanently. 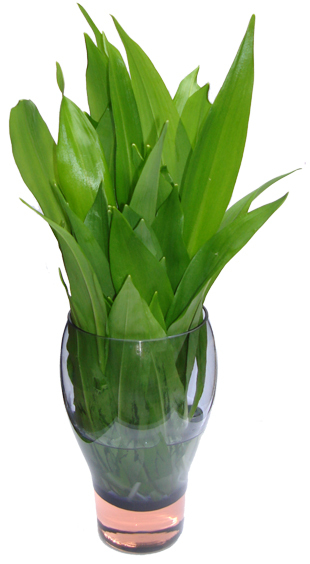 But arrive they did, both beaming broadly and bearing a fragrant birthday bouquet – of wild garlic! Lucas had been in Somerset that morning [the boy clearly likes to get about] and had been so excited to see such an early crop that he must have denuded an entire forest floor. Wild garlic is excellent forager’s food being easy to identify, difficult to confuse with anything dangerous, and abundant. And in this age of austerity free foraged food can only be a good thing. When walking in the woods keep a nostril open for the perfume of garlic, then look for the spear shaped leaves, similar to lily of the valley. Just don’t forget to give it a wash when you get home – you know what bears [and other more common quadrupeds] do in woods. Then use it, well, just about everywhere and anywhere. This week so far it’s been popping up in soups, salads, sauces, and mashed potato [let it infuse in warm milk or cream], and there’s a pesto still to come. 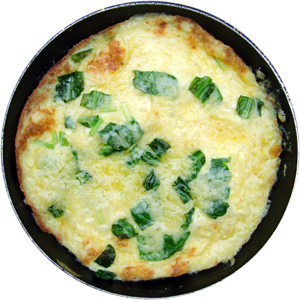 But I think my favourite was a simple omelette, topped with chopped wild garlic while the egg still ran, some Somerset cheddar [in case it was feeling homesick], a good grind of black pepper and finished under the grill. Eggs, cheese and sweet, sweet garlic – I don’t know what it’s like for you reading that list but I can’t write it without salivating. So much tastier than a bunch of tulips. The other day I watched James Martin make this soup in five minutes, so – stopwatch at the ready – I’m attempting the same. I’m doing no pre-prep other than to line the ingredients up on the kitchen counter, possibly in nice little dishes and ramekins just like they do on the telly, and setting up equipment like plugging in the food processor [I’ll just have to manage without the lights and cameras]. In fact I’m sure James had his pan warming before he set off so I’m giving myself the same advantage. Other than that it’ll be a tomato soup time trial from a standing start. I have made a couple of tiny tweaks to James’ recipe. My tomato to stock ratio is a little more tomato heavy, and there’s the addition of my secret ingredient for any tomato soup – gin! I’m not sure my mother would approve of this as a tin of Heinz tomato soup was always her restorative food of choice for an ailing infant, but tomato and gin soup has long been a favourite, and was my first course at the ‘everything must contain booze’ dinner I cooked for friends in Singapore some thirteen years ago. The same dinner, incidentally, where I flambéed eight fillet steaks all at once for the first time, producing a tremendous fireball which briefly engulfed my head, taking with it my fringe, eyebrows and lashes. I was told by the waiting guests who could see into the kitchen through a large hatch from the dining room that the pyrotechnics rivalled the harbour fireworks display at the Singapore National Day celebrations, but it’s not a trick I’ve been keen to repeat since, and I most certainly would not recommend that you try it at home! So then, we’re under starters orders – and we’re off! Pan’s on the heat, in with the oil and start to quarter the tomatoes. Tomatoes into the hot oil and as they fizz and spit chop the garlic. Garlic in, and tear the basil. Add tomato puree, stir, and gin. Salt, pepper, sugar. Basil in. Back to the simmer then pour in the hot stock, and back to simmering point again. Now into the blender or food processor. Whizz, adding the cream as you go. Ready a sieve over a waiting pan [I used the one where the stock had been warming], and pass through the blended soup. Return to a simmer for the final time, taste and adjust seasoning and sugar, and add a splash more gin. My time? A not very respectable 15:00.2. This is not boding well for the three egg omelette challenge, but I’ll post any new personal bests here as and when. Do add comments with your own times. But even at 15 minutes, it’s hardly a huge investment of time for a fresh and tasty soup to beat any can. Quick! The sun’s out again and there’s no telling for how long so fire up the barbecue and chill down the soup bowls. 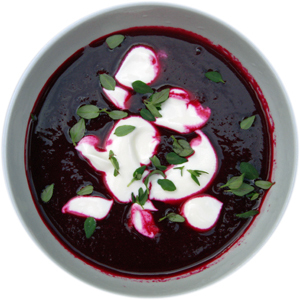 We’ll come back to the barbecue, for now it’s beetroot gazpacho time. Sweet and earthy, and resplendently purple, this makes a delicious and eye-catching summer starter. An online search for beetroot gazpacho recipes at the moment will find numerous references to Aiden Byrne’s elegant assembly of soup with avocado sorbet and vodka jelly, and if you’re looking for a full on production number do seek it out. I’ve based this on Aiden’s recipe and added some twists of my own, but it’s a simpler affair, though none the worse for the absence of the bells and whistles in my opinion. Make no mistake, cooking with beetroot can be a messy business. Their magenta juices will attempt to leave vivid pink stains wherever they can, though these are easy enough to remove from surfaces and implements if you don’t leave them to settle in, and if you wash your hands regularly they should also escape mainly unscathed. That being said, if you’re a hand model about to shoot a commercial for De Beers you might want to wear gloves. First take three-quarters of the beetroot and wrap in a loose foil packet with most of the thyme, reserving a few sprigs for the final garnish. Roast the foil package in a 160˚C oven for an hour and a half. Peel the remaining beetroot and the apple and grate them raw into the bowl of a food processor. Once cool peel the cooked beetroot and grate or chop into the bowl, along with any juices from the foil parcel, discarding the thyme. Tear in the bread and add the juice and zest of the orange or lime – or you could experiment here and use the juice of one and the zest of the other. Finally pour in the beetroot juice. Lid on, and blitz the whole to a smooth purée. Now pass the purée through a fine sieve, pushing through with the back of a spoon or ladle. Start adding salt and tasting as you go, until you feel you have almost added a touch too much salt. 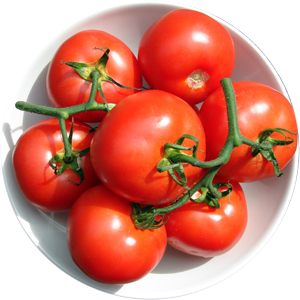 No add the sherry vinegar, and a sprinkle of sugar – the acidity and sweetness should balance out the saltiness. Chill for a few at least two hours, more will do no harm. 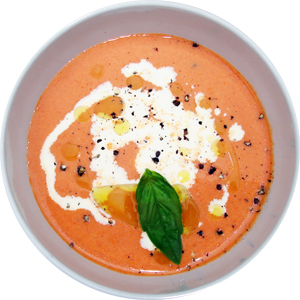 To serve pour the gazpacho into chilled soup bowls, dot with soured cream and sprinkle with thyme leaves. If you have more beetroot juice than you need freeze some in ice-cube trays and add two or three to each bowl of soup. If you’re really looking to make a splash, and have the time and freezer space to spare, you could even serve this in ice bowls – but they are a post for another day.